Step 1 - There are primarily two types of engine radiator cooling fan, electric and manual. A manual fan is connected to the engine drive pulleys and is controlled by a thermo fan clutch which senses radiator heat and engages when the engine is running at higher temperatures. These thermo reactive clutches are constructed to "freewheel" when not in use, and become connected using a silicone grease which expands when heated. This unit uses a set of shaft bearings and seal to retain lubricant and are normally bolted to the water pump of the engine. A clutch fan can fail one of two ways, it can either lock up causing poor mileage accompanied by a whirring sound, (like a small airplane is taking off.) Or the silicone grease can leak causing the fan to "freewheel" while failing to pull air through the radiator. Step 2 - An electric cooling fan is used primarily to boost engine performance and cut down on emissions. 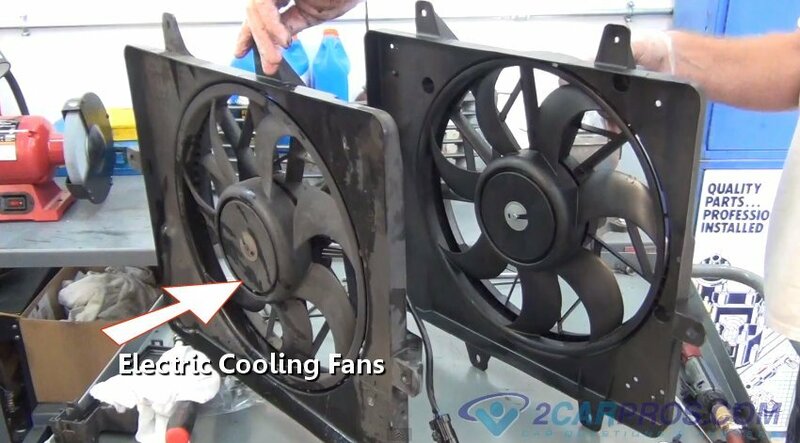 These fans are featured in both front and rear wheel drive vehicles and are activated by a coolant sensor via the computer. Using a sensor the computer detects that the engine temperature is rising above normal limits, a signal is sent to close the fan control relay which is protected by a circuit fuse. When replacing these cooling fans match the failed unit with the new cooling fan. To check a fan clutch condition the engine must be "OFF". Inspect the clutch for leakage at the front or rear of the unit (input shaft and temperature controlled expansion spring.) 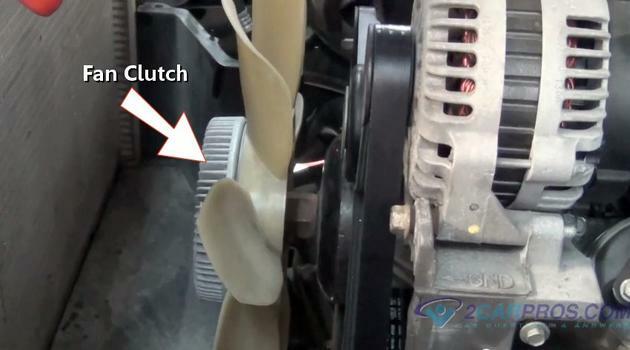 If leakage is observed the fan clutch has failed and needs replacing. Next, take the fan blade and turn it, the fan blade should "free wheel", if you cannot turn the fan blade, the clutch has locked up or if excessive play is observed replacement is required. An electric fan motor should "freewheel" also, if resistance is observed the fan motor has failed and replacement is required. A clutch fan can fail one of two ways, it can either lock the fan to the clutch causing poor mileage while producing a whirring sound, like an airplane is taking off next to you. Or the silicon grease can start to leak causing the fan clutch not to lock up allowing the fan to "freewheel", failing to pull air through the radiator when needed. To check for this condition the engine must be off, inspect the fan clutch for leakage at the front or rear of the unit (input shaft and temperature controlled expansion spring). If leakage is observed the fan clutch has failed and needs replacing. Next, take the fan blade and turn it, the fan blade should free wheel, if you cannot turn the fan blade the clutch has locked up and needs to be replaced. The engine cooling fan is designed to move air through the radiator when the vehicle is at slower speeds or stopped. This air flow removes heat from the coolant created by the engine using the radiator as a conductor. An engine cooling fan is temperature controlled to only run when needed. All engines have a preferred operating temperature and need to warm up to operate at peak efficiency. Temperatures above normal, even for short periods of time can cause internal engine parts to fail. Occasionally the fan will be audible after the engine has been shut off, this is normal and is performed to lower engine temperature to acceptable levels. Usually, electric fans will activate shortly after the air conditioner is turned on, this is done to dissipate the extra heat produced in the condenser while the air conditioner is in operation. Engine cooling fans are temperature controlled to only run when needed. All engines have a preferred operating temperature which require a warm up period to operate at peak efficiency. Temperatures above normal can cause internal engine parts to fail. When cooling fan operation fails it will cause engine coolant to retain heat, forcing the engine to run hot and eventually overheat. The first clutch fan was developed in the late 1960's and was in full production by the early 1970's. This clutch fan was designed to save energy and lower emissions. Before the clutch fan, an engine utilized a fixed style of fan that was directly bolted onto the engine. This direct style of fan is not only inefficient it produced excess noise that was undesirable. A clutch fan has the ability to disengage when not in use, allowing the engine to work more efficiently while decreasing fan noise.